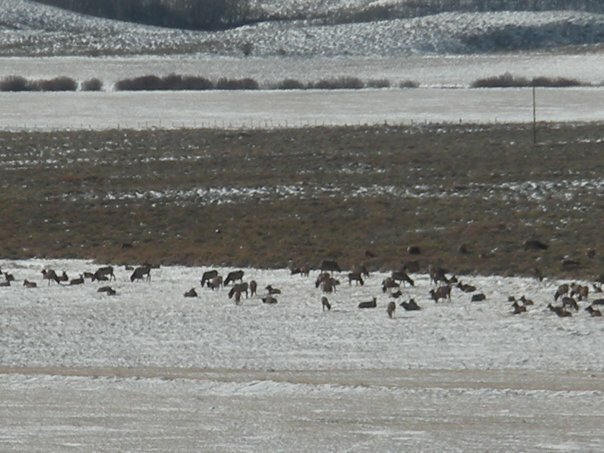 We offer 4 day, 5 day and 7 day hunts according to the seasons set up by the Colorado Department of Wildlife. These can be bull elk, cow elk, deer and combinations of bull and/or cow elk and deer. These are semi-guided hunts with help in the field with your game. We have jeeps for hauling you and your game to a from the hunting areas. We also offer walk-in hunts on BLM land in the Indian Creek area. Deer and elk can be processed at locker plants in Kremmling and Steamboat Springs, Colorado. If you want to do it yourself in camp please bring what you need to do it. By drawing only. Call for special limited hunts. Semi-guided only. Draw only season or private-land only. Bull/cow combination or cow by draw only. Bull elk require 4×4 or 5″ brow tine. Buck deer by drawing only. Over-the-counter bull elk, cow by drawing only. Bull elk required 4×4 or 5″ brow tine. Bull and cow elk by drawing only. Bull elk require 4×4 or 5′ brow tine. Bull elk hunters can hunt extra deer or cow elk for an extra cost of $500.00 each with the purchase of a leftover tag (if available) or deer tag. $450.00 extra for pick up and delivery from and to Hayden or Steamboat Springs, Colorado airport. Youth age 16 years and under hunt for 1/2 price! Licenses can be purchased in Colorado up to the day before the hunt. It is best to write or call the state* and purchase the license in advance. However you will have to draw for bull elk 1st and 4th seasons only. Cow elk, deer or muzzle loading permits are draw only. Also, you can draw for private land only bull and cow combination, 1st season only. Buck deer drawing for early and 2nd, 3rd, and 4th seasons only. Contact Colorado DOW for forms for the April 2017 drawing. For the last three years, no preference points have been necessary for the 4th Season draw in Unit17. You may also request the form via e-mail Ask DOW and they will send you a brochure. A non-resident bull elk license is currently $641.00, but may change, a non-resident cow elk license is $481.00, and a non-resident deer license is $386.00. Buck deer can also be hunted at the same time in the 2nd, 3rd, and 4th seasons. There are no doe deer permits for Unit 17. Please note: Anyone born after 1949 is required to have a hunting education certificate to obtain a license, and California hunters must have a valid state issued hunter education card. Also persons ages 19-64 need a habitat stamp at a cost of $10.00. Licenses must be purchased no later than the day before each hunting season on over the counter permits.